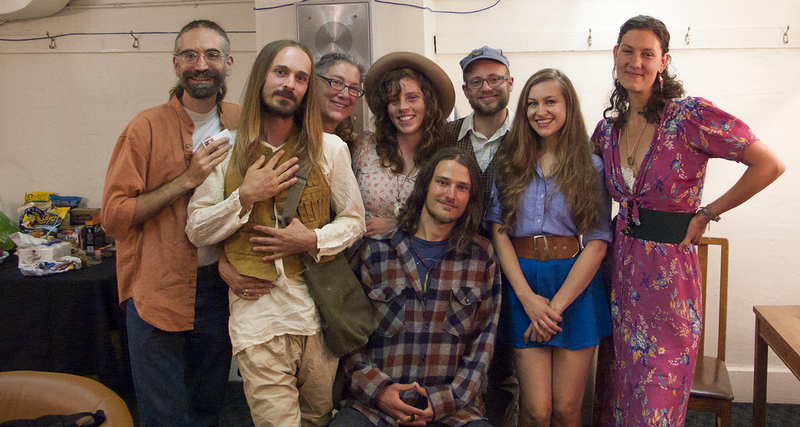 Well over a year ago, we met as a group with Joanna Newsom, one of the most prominent members of the modern psych-folk movement. Her recording Ys is one of the most beautiful CDs to have come out in the last few years. 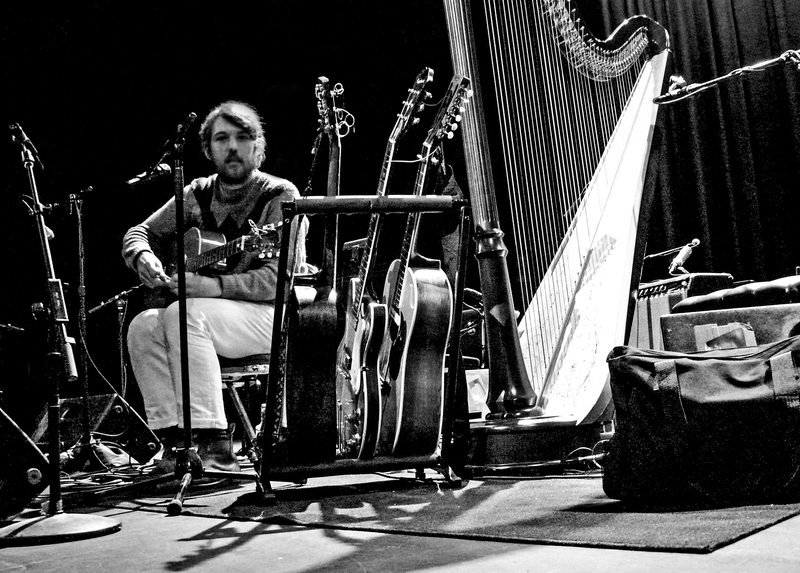 While we were talking backstage in her dressing room at the Moore Theater, Robin Pecknold, lead singer of the Fleet Foxes was rehearsing on stage. His gorgeous guitar and voice echoed ethereally through the halls and created the perfect background sounds for this interview. The following conversation with Joanna addresses topics we all feel: The courage to share our authentic voice; pressures to to fit in; staying true to oneself; creative inspiration; insecurity and the songwriting process. Feel free to forward this to share this with the teens you love and care about. Heather Wolf: I’ve been thinking a lot about one’s voice and true expression, particularly the female voice. I facilitate a youth arts camp where I find few young women with any musical practice of their own. I find many young women at the camps have blocks to opening that form of creative expression, because of their discomfort with being heard. I am curious about your experience with this, especially because I witness your own unique voice in your work, and recognize the courage and trust that takes. Joanna: I feel like I had a lot of luck and blessing to come of age creatively in an environment that really welcomed my voice — a family and music teacher that welcomed it. I had a music teacher that encouraged improvisation and composition from the very first lesson, from when I was a little child. She always valued the writing voice of her students. I did have a very similar experience, not only in terms of hearing someone’s singing voice, but in hearing someone’s writing voice. It was very rare, I felt, for girls to be heard. Growing up in my small town, I knew a lot of young women who were musicians, but almost all of them were classical or folk musicians and none of them wrote. It was one of those towns where all the people who were a few years older than me were in a band; amazing local bands that we were fans of. There was a certain point that I realized they were all guys, all of them, including my big brother, whom I idolized. He was in all of these rock bands and I was kind of the weirdo harpist, you know, writing music. For years between about age ten and age nineteen, I didn’t sing at all. I wrote music. I decided in my teens I wanted to pursue composition as a career, but I stopped singing, because I didn’t think I had a pretty voice. Prettiness or a lack of prettiness is often something that’s discussed vis a vis the female voice much more than with the male voice. Even in popular music my examples and the idiosyncratic voices that I admired were men, like Bob Dylan. And then when I was in college I started taking classes that were surveys of American music and starting hearing women’s voices that were very different than those in pop music. I started to realize my own voice was something I could consider to be a tool, at my disposal, in the same way that the harp was, and in the way that my compositional voice was. But it took a long time, and I sympathize with any young person, male or female, who’s trying to find their own singing voice, because if you happen to not be exposed to a very wide array of music, I feel like it’s hard to know that there are lots of ways that beauty can reveal itself in music. Melanie: This is just the struggle I’m experiencing, getting into the Jell-O of my own creativity. With your work, something that amazes me is the level of authenticity you bring out into the world that you don’t keep within yourself. I’m curious to know what the process of coming out is like. Joanna: You mentioned the idea of authenticity, being able to make music that is truly a reflection of yourself on every level, and I think I certainly went through a period in my life of inauthenticity. That happened for me, as I think it does for a lot of young people, from maybe sixth to eighth grade, when I was trying really hard to fit in. I really wanted to like the things that other people liked. The music other people liked, the clothes other people liked. I was trying to locate the appeal in those things desperately, listening to pop music, wanting to be tough—the whole gamut of things people do to be liked and admired by all their peers, and this also coincided with me not being very happy. I moved around in schools. To public school, then to a more creative private school, and scattered years in Waldorf schools. Even when I was in Waldorf school in eighth grade, it wasn’t some perfectly idyllic place where the pressures of wanting to be cool didn’t apply, it just maybe had different standards. I think anywhere you are at that age, most folks struggle with that. Honestly, somehow, around my ninth or tenth grade year, I just stopped caring. I just stopped. I started wearing really weird clothes, and having a wide range of friends who didn’t necessarily know each other. What I think it was, actually, was that I was in love with music. The key, I believe, for pulling yourself out of the limbo of not knowing who you are or not embracing who you are, is to love something enough to not care. Sometimes it takes us a long time to find it. There are so many things out there, there’s so much nuance to being human beings, it sometimes takes a really long time to locate it. But for me I loved it [music] more than I loved the unattainable goal of being cool. It is important not to judge yourself or censor yourself along the way with those questions: “Has this been done before?” or “What am I doing right now that makes this worth doing?” You just kind of do it. Heather: How do you work through self-criticism? Joanna: I work in phases. When I’m sketching out a song, I don’t let myself be too critical of it. I actually love editing my work. I love interacting with the text, transforming it by rearranging it, the syntax, nuance, and all that. There’s a way to approach it where it’s not scary and judgmental towards yourself. There are different phases where different kinds of editing come in, and the phase where I’m allowed to wonder if a song or a record is going to be terrible is when it’s finished. And then sometimes I will throw out a song, or be like “No, this one doesn’t represent what I want this record to sound like.” I make little deals with myself: hold it at bay until the work is done, and then you can tear it apart as much as you want to. Just a moment ago, Melanie mentioned the word “ritual.” I’m wondering, are you a disciplined person by nature? Do you have any rituals that help you creatively? Joanna: No. In fact music is the only thing in my life that I’ve ever had any discipline about. Ever! Linda: So you don’t get up in the morning and ritually do yoga and meditate? Joanna: I stay up ‘til six in the morning and sleep ‘til two some days and get a coffee and look at silly things on the internet. You know, I would deeply love to get more discipline into my life but there’s the one thing that you really love, and sometimes for people that’s lots of things, but you’re able to summon discipline around that task because it brings you joy. If you’re forcing it, if it’s a chore, you don’t want to do it. Corbin: I play music, and when I perform it, I always feel I’m giving just a little piece of myself to an audience, and sometimes it’s received and sometimes not. Would you give insight on how that must be on a daily, yearly basis, to be constantly giving, and how you rejuvenate yourself, or when you get off balance, what you do. Joanna: I don’t know before I go onstage whether or not it’s going to be a performance where I’m totally present, connecting with the band and the audience, or whether it’s going to be a performance where I’m struggling the whole time to get there. In a way I actually love that it’s so possible to have a terrible show, because it reminds me of the lack of control. If you could guarantee that every show you played for the rest of your life was going to be amazing, it would be so boring. There would be no stakes. I’m still learning how to construct tours, or arrange my day before a show so that that I’m not completely run ragged by the end of a tour. I used to do seven or eight week long tours and now I’m doing three, two-week tours and then taking big breaks between them. Joanna: “Ees.” It’s the name of a mythical French city on an island in Brittany, and there are various mythical and historical documents that suggest it did exist, that it sunk beneath the ocean. Viox: What inspired the Ys album, and what are the mythological implications of that? I actually dreamt that the album title needed to have a “y” and an “s” in it, in some permutation of those letters, and it needed to be single syllabic, and a word that didn’t immediately connote anything for most people who picked the album up. Basically the whole album had been constructed as this very delicate and in many ways formalized or stylized projection of very brutal and simple human emotions that I had gone through. I finished it, it was like it was in a snow globe—this little hyper-stylized, detailed world, where I had been so detail-oriented, from the lyrics to the composition to the arrangements to everything, and somehow I wanted the title to feel just like a rock through a window. To have this brutality and instantaneous confrontational energy to it, like, ‘What is this word?’, ‘This is hard to pronounce’, ‘It looks funny’. I was actually reading somewhere a text about Ys, and there was a line in the text that was the exact wording of a line in one of the songs, the wording “It is that damnable bell.” It was really weird. There were all these connections that chose the title for me. Linda: So it sounds like you get very inspired by your own emotions and your life, really, and that is what you bring to most of your music? Joanna: This is a very controversial position of mine, but I personally believe that every fiction that we gravitate towards, reading or writing, is some reflection or projection of our own lives and is our way of working through it. One of the reasons that, say, a novel is successful–in terms of the story that’s being told–is often because it resonates with something that has happened to many of us, an emotional truth. Eric: I think a lot about voice, and I’ve heard you talk about composition. Were you always a songwriter, were you always writing lyrics? Linda: Thankfully for all of us who love music, that phase didn’t last!